We recommend that optical channels be calibrated annually. All other sensors should only be recalibrated when there is an indication that they have drifted or are otherwise operating improperly. Request a Return Material Authorization before returning. 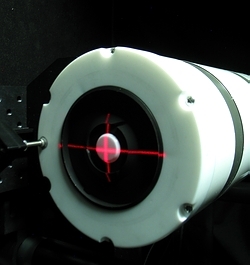 Biospherical Instruments Inc. has a long history calibrating and characterizing optical instruments — hundreds of instruments annually. A full-time optical engineer is in charge of our 40 m2 calibration laboratory and oversees all calibrations. These include single channel broad-band (PAR) sensors, multichannel ocean color radiometers, and high-resolution scanning UV spectroradiometers. In addition to our calibration laboratory, we maintain a solar calibration facility on the roof of the company’s building where the spectroradiometer of the NSF UV Monitoring Network is also located. The UV-B channels of GUV radiometers are regularly calibrated against this instrument. We are regular participants in NASA and NSF sponsored calibration intercomparisons whose results are published in agency technical bulletins.